Pneumatic squeezer and yokes — About halfway through my first plane, the RV-8, I broke down and spent the money for a pneumatic squeezer. Man, was I glad I did! 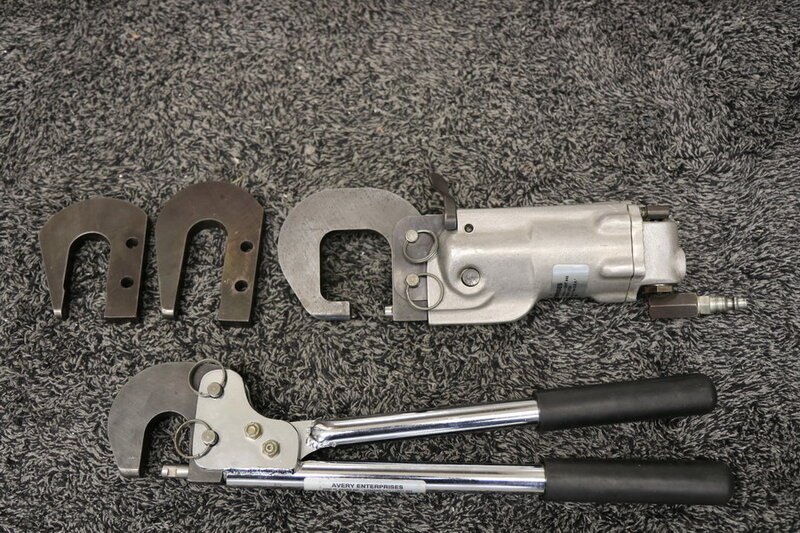 This really speeds dimpling and squeezing rivets, but be advised it won’t do you any good without a reasonable assortment of yokes, and some of them can be expensive. Here’s a pic of my squeezer setup which includes a manual squeezer like the one everyone starts with, the pneumatic squeezer, four yokes, and adjustable shafts in both squeezers. This set-up, especially the pneumatic, have served me well with the -12 right from the start. I purchased all of these items from Avery back when they were in business. Blind rivet pullers — With blind rivets, aka pulled rivets, aka “pop” rivets, being the predominate fastener in the RV-12 a builder will have over 12,000 rivets to pull. You’re going to go MUCH slower and get tired hands and big blisters if you don’t included some sort of powered squeezer. 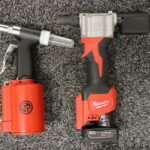 This time around I immediately bought one of the standard type pneumatic rivet pullers which works fine, but then I saw Milwaukee’s battery powered system and was intrigued. I found it is part of Milwaukee’s M12 system build around the M12 lithium-ion battery system. 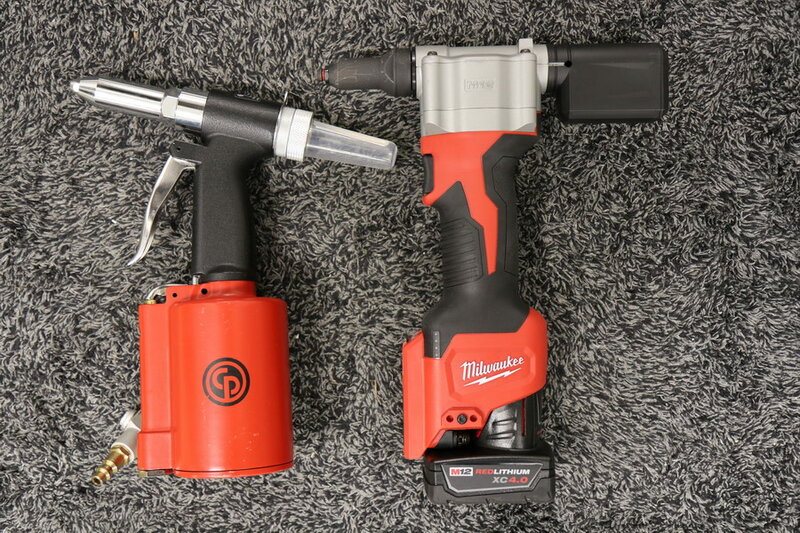 I decided to try one and also add a cordless drill to my toolset as well that uses the same M12 battery and to supplement my pneumatic drills. I purchased the puller, drill, and batteries at Home Depot. 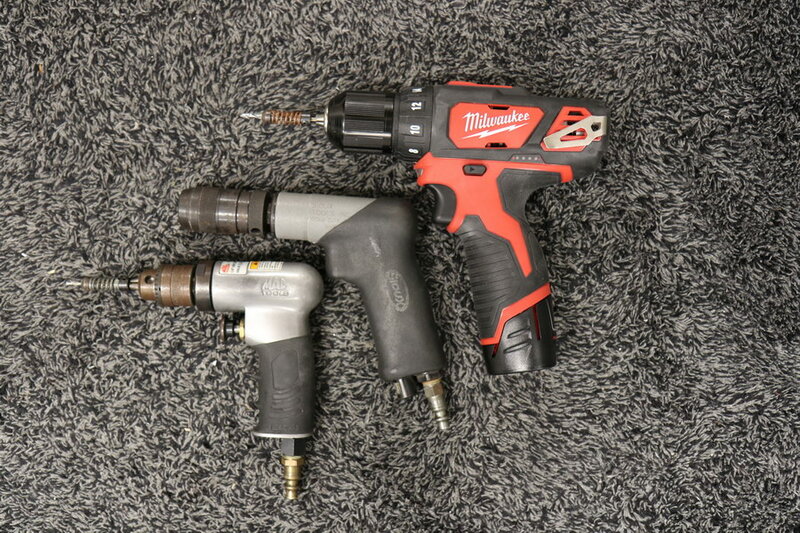 Drills — With my past builds I had always used pneumatic drills and had to so I could keep one bit in one and another size in another. 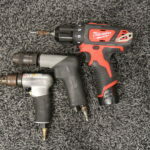 Pneumatic drills are light but supplementing my pneumatics with this battery powered drill with the quick-change chuck has proven a real timesaver. Avery RV-12 corner rivet puller assistant — With the RV-12 there are quite a number of pulled rivets along ribs where the nose of the puller won’t readily fit. 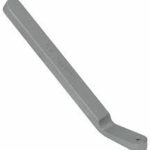 Van’s provides some aluminum angle stock that the builder can fabricate some little wedges with to facilitate using the puller at an angle but it is quite fiddly and slow. 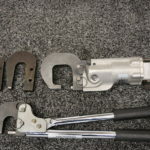 While surfing the web for tools I found Avery’s RV-12 Corner Rivet Puller Assistant, glad I did. 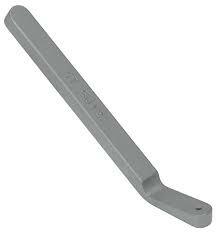 Just get it, you’ll be glad you did, I bought mine at Aircraft Tools Supply.